We all enjoy our outdoor activities but without the best insect repellent, there’s no way we’ll be able to walk, climb, hike or do anything else in the woods without feeling uncomfortable when there’s an army of mosquitos out for blood. We provide a little information here from the CDC and FDA, so that you’ll get an idea of the diseases that are transmitted by insects. The biggest concern with millions of people is mosquito-borne diseases that spread by these blood-sucking insects. Mosquito bites can cause skin irritation such as red spots and itchiness. This is because of a substance known as an anticoagulant which can be found in the saliva of the mosquitoes. Once the mosquito bites the human skin, the saliva flows into the epidermis. It then leads to skin irritation. A good mosquito repellent often means the difference between an enjoyable summer of outdoor fun and three nightmarish months in mosquito hell. But what kind of insect repellent will do the best job of keeping you bite free? Read on and we will teach you how to find the best insect repellents so that you can enjoy your outdoor trips. With so many insect repellents to choose from, it can be difficult to find out which one is the best for you. However, by knowing what to look for, taking into account the activities you’ll be engaging in as well as other considerations, you’re better prepared in finding one that is most suitable for you and your family. Most insect repellents work in general against all kinds of insects, but there are also specialized repellents that work best against a certain type of insects. Mosquitoes are carriers for the West Nile Virus and St. Louis encephalitis. Do apply EPA-registered products for effective results. To protect travelers from aggressive mosquitoes that carry malaria, you are advised to use repellents, treated clothing, bed netting and preventative pre-travel medication. Similar to Malaria, the CDC recommends using repellent and other preventative pre-travel medication to prevent the mosquito bites that carry Zika virus. Not just mosquitoes, insect repellents should also be able to ward off ticks. Ticks transmit diseases such as Lyme disease, Rocky Mountain spotted fever, and babesiosis. A combination of active ingredients such as DEET and permethrin-treated clothing would act as a good tick defence. There are some other types of insects you may need protection from in the wild, such as the gnats, chiggers, and flies. For more recent news of specific locations, do visit the CDC’s travel site. In the market, you can’t expect all products to be the same, and that includes insect repellents. You’ll find all sorts of different insect repellents in the form of gel, spray, cream and aerosol. There are also wristbands, but we’re not sure if they are effective as there is insufficient evidence to prove their effectiveness. Typically, the ingredients contained within each type of repellent are different, even if they come from the same product line. Pay a closer attention to the level of DEET and how stable the product is. Typically, a good product would be able to guarantee that their DEET level will be stable for 3 to 5 years. To determine how long the insect repellent can stay effective for, you’ll have to look at the level of concentration of the active ingredient. Despite a diverse range of products, the most common active ingredients that can be easily found in the market are DEET and Picaridin. Both of these ingredients are effective at preventing mosquito bites. However, Picaridin is odorless and so is considered to be more pleasant to use. Since the year 1957, people have been using DEET. It has since become the most commonly used repellent. There have been many reviews stating that DEET is safe to use and that there are no side effects on human health. The idea is that those products that contain the lower concentration of this active ingredient would mean that you will have to apply frequently for effective results and that if the product consists of a higher concentration of DEET, it’ll be very effective. DEET is successfully registered under EPA, so there’s evidence to prove that it is safe to use. You can also try combining DEET with clothing that are permethrin-treated, as they will be able to protect the wearer from ticks. Another alternative ingredient other than DEET would be Picaridin. It became available in the US in 2005. The maximum concentration of Picaridin would be 20%, and it provides protection for up to 8 hours. Even one of the world’s biggest organizations, the World Health Organization (WHO), has recommended this active ingredient, so it’s safe to say that Picaridin is indeed effective. The great thing about this active ingredient is that it does not cause damage to any fabric, surface or material. However, do keep in mind that this component is not suitable for kids under two months old. People often get confused on how the concentration of a repellent determines the level of protection. Just when you’re thinking of keeping those mosquitoes away from you, you’ll have to focus on finding the level of concentration of the ingredient contained in the insect repellent. Many customers asked the same question: is there a difference between an insect repellent that has a concentration of 80% active ingredient and another with only a concentration of 10% or uses less active ingredient? Well, hikers who are going to be in the woods for about 6 hours or longer will need the insect repellent with higher levels of concentration. The longer you need to protect your skin from these insects, the higher level of concentration of active ingredient you should be looking for in the insect repellent. When you’re looking to buy the right and suitable insect repellent for yourself, make sure to consider what kind of activity you’ll be needing it for. If you’re only going for a short and quick trip outdoors, such as to your backyard to do some gardening or to the park, you can always go for a low concentration insect repellent, which should be able to do the trick. As for a major hike, camp or fishing trip which means you’ll be staying outdoors longer, you’ll need to look for an insect repellent with a higher level of concentration. If you’re wondering whether the formulation matters, the answer is, not really. The formulation probably doesn’t make much of a big deal here, but the choice of the active ingredient is more of an important decision. Are insect repellents that are made of natural ingredients the best choice? You’ll find that natural repellents are safe to use, but studies have shown that it may cause skin problems. Do not confuse yourself with essential oils. According to recent marketing strategies, most businesses often have the notion that as long as they advertise the product as a ‘natural’ or ‘chemical-free’ product, they would be able to attract customers and this may mislead them into thinking that these products may be a better option in comparison to products made of chemicals. As advice, not all ‘natural’ products are as effective as they have been advertised to be, as researchers have yet to come up with conclusive results to demonstrate their effectiveness. Products containing botanical extracts may offer protection, but because they are free from chemicals and purely ‘natural’, you’ll have to apply them more frequently. Natural insect repellents may be very popular in the market, but it is no doubt that one of the most popular ingredients, DEET is still the most popular and effective ingredient. To conclude from this, DEET and Picaridin-based repellents are still the best as they are cheaper and more effective. They’re also able to provide protection from mosquito-borne disease, still, the chemical ingredient that most would go after. Do note that there is some resistance to the use of these chemical repellents. And why is that? It is because they’re unpleasant to use, and they are usually thought to bring damage to clothing or belongings and is believed to pose adverse health effects. When it comes to product safety, it cannot be denied that products made from natural ingredients are much safer to use, especially for those with sensitive skin. However, according to recent reports, there has been an increasing use of these two chemical ingredients and that there have been no serious adverse reactions reported. Due to this reason, you’ll be able to find that most insect repellent products that are endorsed by health authorities internationally may contain these two ingredients, labelling it as a safe way to avoid mosquito bites. Remember that insect repellents are only limited to adult and children ages four months old and above. For babies older than three months, we recommend that you look for a child-specific insect repellent. Before you’re thinking of making a purchase, do check whether the insect repellent that you’ve picked is a registered product or an unregistered product. Before these products can be put on the shelf of the stores, they must first be registered with the EPA. There is a diverse range of repellents made of plant oils and Approx. thirty of them are exempted from the EPA registration. So not all botanical plant-based or natural based insect repellent would necessarily mean that they’re effective and safe. It’s important to bring an insect repellent with you when you’re going for an outdoor adventure. But the question then lies in what are the best insect repellents? 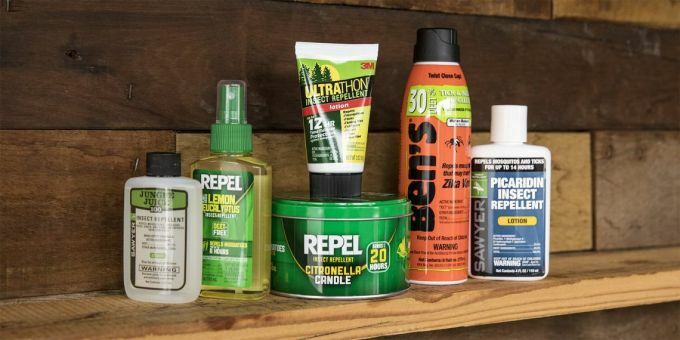 We’ve included our reviews on a few of the best insect repellents that we think you should try. It may not be suitable for all activities, but you can have a look at the reviews here and find out which one suits you best before deciding on purchasing it. Description: The All Terrain Kids Herbal Armor is very safe, natural and DEET-Free. It uses 6 natural-repelling oils at 25% total concentration. Some believe that just because a product contains natural ingredients it won’t be as effective as those made using chemicals, but the All Terrain Kids Herbal Armor debunks that myth. It has been clinically proven to be 100% effective for 2 hours, 95.8% effective for 3 hours. Also, the best thing about natural insect repellents is that you can leave it on even as you sleep through the night. You can’t do this with chemical insect repellents, as you’ll have to wash it off before you enter the tent or your sleeping bag. It is sweat and water resistant and it won’t damage clothing or equipment. That’s why this product is perfect for active outdoor enthusiasts. No matter how much you perspire as you challenge the tough terrains, you’ll never have to worry about the effectiveness of this insect repellent wearing off. This product contains peppermint, cedar, and lemongrass as active ingredients, so its smell may be quite sharp and strong when you’ve just sprayed it on, but it’s not a bad smell and it will fade off in a while. A bit less effective than full-chemical insect repellents. Related: The aforementioned version of the All Terrain Herbal Armor is for children. If you’re looking for something that is also effective for adults, you should purchase the All Terrain Herbal Armor DEET-Free Natural Insect Repellent. The ingredients are mostly the same, but the one for adults is just a little bit more potent. Description: This Sawyer Premium Maxi-DEET Insect Repellent is a great spray to bring along to the wilderness as it offers the best, most technologically advanced solutions for protection against the sun, bugs, water and injuries. This product features an exclusive low-odor formula with 98% DEET which offers excellent levels of repellency in areas of extreme bug density. It protects against mosquitoes, chiggers, fleas, gnats, and ticks and the diseases they carry. It can be applied to skin, mosquito nets, head nets and clothing and it is effective for up to 10 hours. Besides that, it can also be used in combination with Sawyer Permethrin Spray for full body repellency. It is easy to use as it won’t stain your clothing or your bed sheet. However, you may need to reapply it quite often because it is neither waterproof nor sweat-proof. It is also not a very effective fly-repellent. You’ll need to combine it with Sawyer’s Premium Insect Repellent with 20% Picaridin for that. Related: If you feel that the aforementioned product is too potent, the Repel Sportsmen Mosquito Repellent Wipes is a good alternative with its 30% DEET. Description: This is a safe and natural alternative for your outdoor activities. The Ovvio Oils Natural DEET-Free Insect Repellent is 100% natural, with all of its ingredients derived from nature, which makes it non-toxic and therefore a safe alternative to chemical-based repellents. It’s different from all the other natural insect repellents out there in that it’s made from pure, undiluted essential oils. The manufacturer also took extra care in handling the essential oils. Although it’s a bit more expensive than the other insect repellents, the resulting quality is well-worth the money. It contains no DEET or pyrethrins. It is safe to be applied on the skin—even sensitive skin—and is recommended for use on kids and household animals. It contains a pleasant aroma that’s not too overpowering thanks to the Lemon Eucalyptus contained within. The product also features a long lasting effect, keeping insects and bugs away from 4 to 6 hours and is sweat and water resistant. Related: This manufacturer also produces essential oils designed to fulfill your other needs beyond insect-repelling. If you have trouble sleeping at night, for example, this Ovvio Oils Slumber Rest and Recovery Blend will help. The soothing smell and the coolness it leaves on your skin will help you drift off even when you’re sleeping on hard ground out in the wilderness. Description: The non-greasy, odorless Sawyer Premium Ultra 30% DEET Insect Repellent combines 30% DEET with a comfortable liposome base for up to 11 hours for protection against mosquitoes, ticks, flies, chiggers, fleas and no-see-us. It is airline friendly in its 3-ounce bottle. It is also non-staining, compatible with sunscreens and is sweat proof. The formula of the spray is comfortable for the skin, easier to wear and practically odorless. Its liposome base is practically a breakthrough in the industry of insect repellents. It captures the DEET and releases it bit by bit as needed. This reduces the need for a higher level of DEET in the compound, resulting in a safer and more natural insect repellent overall. The liposome base also allows this insect repellent to be practically odorless. At times, you may even forget that you’re wearing a layer of insect repellent on your skin. But rest assured that it will protect you properly. Related: If you’re really against the use of DEET in insect repellents and even the 30% contained in the Premium Ultra 30% DEET Insect Repellent is too much for you, perhaps you should consider purchasing Swamp Gator Insect Repellent Deet Free Spray instead. It’s 100% DEET-free and is almost just as effective. Description: The Cutter Lemon Eucalyptus Insect Repellent is designed to repel mosquitoes for up to 6 hours. The product contains lemon Eucalyptus oil and repels mosquitoes that may transmit the Chikungunya, Zika, Dengue and West Nile viruses. You can use it with confidence, knowing that it will not harm your fishing line, camping gear, watch crystals or tackle box when used as directed. It is non-staining, so it’s also safe for your clothing and bed sheets. Thanks to its all-natural ingredients, this insect repellent is safe for children and household pets. People with sensitive skin can also use it without worry—knowing that it’s 100% DEET-free. Its effectiveness may have been reduced a little by the lack of DEET, but it’s good enough to repel most insects as long as you reapply it often. This product will keep you safe in most outdoor areas. If you’re headed for a highly infested areas where the insects are really savage, though, you might want to go for an insect repellent that contains DEET instead. Related: If for some reason you can’t purchase the Cutter Lemon Eucalyptus Insect Repellent, this Repel Lemon Eucalyptus Natural Insect Repellent is a good alternative. The two products are nigh identical. Both are DEET-free natural insect repellents that contain lemon Eucalyptus. Although, dissimilar to Cutter, Repel should not be used on pets. Weight: 12 oz., 24 oz. Description: The Sawyer Premium Permethrin Clothing Spray is odorless after drying and it will not stain or damage the clothing, fabrics, plastics, finished surfaces or any of your outdoor gear. It features an insect-killing formula that is effective against ticks that carry Lyme disease and other fairly common diseases like Rocky Mountain Spotted Fever. It consists of an active ingredient: Permethrin (0.5%). This ingredient makes this product as effective as a 100% DEET insect repellent, but much safer. It lasts for a very long time. If you don’t wash it off, it’ll last for up to 6 weeks. If you do wash it, it’ll still be able to withstand up to 6 washings. It goes well beyond waterproof and sweat-proof in that regard. This is the go-to product of the U.S. and Canadian militaries for almost 30 years, so there’s no need to doubt its quality. It’ll protect you even in areas with really high insect density. Related: If you want to have additional insect protection for your clothes, you should consider the 36 Hour Mosquito Repellent Patch, which is DEET-free and non-toxic, and can be placed on clothes, bags and shoes. Best use: It is great for any outdoor activities. Description: The Sawyer Premium 20% Picaridin Insect Repellent is safe and effective against mosquitoes, ticks, and flies. It is available in both spray and lotion and it is long-lasting. It consists of 20% Picaridin which is effective for up to 12 hours against mosquitoes and ticks and 14 hours for lotion. It is said that Picaridin is better than DEET because it repels a wider range of insects than DEET does. Other than ticks and mosquitoes, Picaridin is also effective against gnat, chiggers, and all kinds of flies. It will also protect you from the Zika virus. Both the spray and the lotion would provide up to 8 hours of protection against biting flies, gnats, chiggers and sand flies. It is an advanced solution for protection against sun, bugs, water and injuries. This product is very versatile because it can be used in conjunction with a sunscreen. It’s also non-staining so you won’t have to worry about it damaging your gear, clothing, or your bed sheet. Related: In case this product does not work for you but you still want to try other DEET-free products, you should consider purchasing the Maky Outdoors Mosquito Repellent Bracelets, which work quite admirably against insects despite being unconventional. Description: The advanced 3M Ultrathon Insect Repellent Lotion features controlled-release technology developed to give military personnel long-lasting protection in challenging situations. It has been tested in the world’s most demanding insect environment, such as the infested jungles of Central America. It consists of a low percentage of DEET which is safe enough for the entire family to use. The level of DEET contained is different from one application type to another. The lotion contains 33% of DEET. 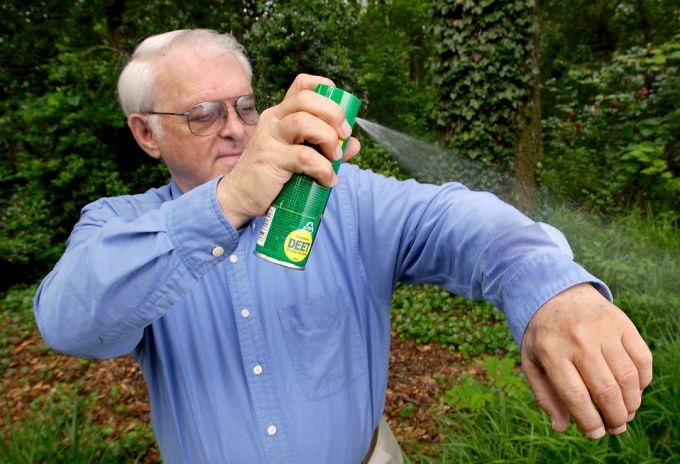 The aerosol contains 25% of DEET, and the spray pump contains 19% of DEET. This DEET level is stable for up to 5 years for the lotion and up to 3 years for the aerosol as well as the spray pump. It allows time released protection for up to 12 hours. It is also splash and sweat resistant to ensure consistent protection through all your outdoor activities. It repels deer ticks that may carry Lyme disease and mosquitoes that may carry West Nile virus. Related: If the small size of this product is off-putting to you or if you’re planning to take a long trip and you don’t believe that 2 oz. will be enough, consider purchasing the NEOR 100% ALL Natural Insect Repellent Bracelet instead, which is just as effective and will last longer. Best use: It is great for short outdoor activities such as gardening or short walks in the park as it is DEET free and PABA free. Description: The Avon Skin So Soft Bug Guard Lotion is non-greasy and it provides moisturizing protection with Aloe and vitamin E. It also comes with an SPF 30 sun protection, so it’s an all in one package that’s great and really convenient for a short outdoor excursion. The product has been dermatologically tested and is hypo-allergenic. Even people with sensitive skin should be able to enjoy the benefits that this product offers without worries. It is also DEET free and PABA free, suitable for the entire family to use. It is waterproof and effective against insects. It feels gentle on the skin and is pleasantly non-greasy. It is also sweat-proof, so even if you work up a sweat after working outside for some time, you won’t need to reapply it. You can even pile makeup on top of it. All in all, this is a great insect repellent for everyday use, but may not be effective enough for the really infested areas. Related: If you’re looking for other similar products that also work as insect repellents with skin-soothing properties, the Foot Soak with Tea Tree Oil and Epsom Salt is a great alternative. Now that you know the products which are the best insect repellents on today’s market, you should also learn how to properly use them. Do not just spray it as if you’re using a perfume! The effective way would be to spray it evenly on your skin. Be careful of direct contact with your eyes. To be safe, spray it on your palms and apply it on your skin. If you’re going to get wet either sweating or going for a swim, you’ll have to apply it frequently. Consider what kind of activity will you be going for and from there, you’ll be able to tell how long you would want to be protected for. Are you going for a short trip outdoors or a longer trip in the woods? Decide on the different levels of concentration needed for the type of activity. Try not to wear dark color clothes or perfume as these will attract mosquitoes. We hope that after reading this, you’ll be able to understand more about insect repellents and that you’re able to come to a decision on what kind of insect repellent you should be purchasing. Are there any great insect repellents that we’ve missed? Leave a comment below and share your recommendations with us!